After each test I had more than one person in the office comment, how much fun the tests were and how particularly colorful some of our Backers can be! Once again, thank you very much to you, our Backers. As an extra thank you, we’ll have an IT test this weekend. Details are included at the bottom of the update and will be followed by a reminder on Friday. So if you’re in IT, watch your email! 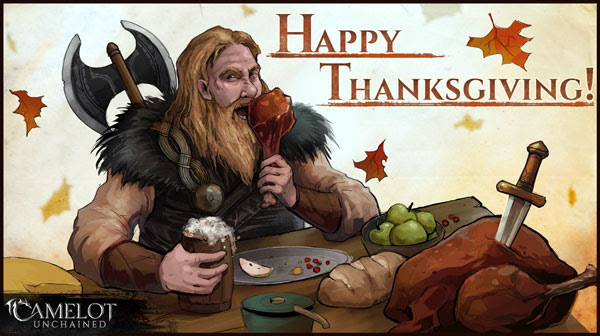 We’ll be out of office Thursday and Friday of this week, and back to work Monday, looking to expand the scenarios to support even bigger battles, with more mayhem courtesy of you guys and gals! As it’s a short week, I expected our Top-Tenish, to possibly not reach ten items. However, we’ve got eleven highlights this week. Read on! WIP – Tech – Scenario Management Updates: After two successful tests of our current SNS build this week, Caleb is working on automating our scenarios so admins are not required to oversee them. Scenarios will auto-restart when they complete, and players will be able to enter a fight when the latest scenario is ready. WIP – Tech – NPC updates: For scenarios, Caleb has updated how we manage NPCs. When a scenario ends, NPCs will no longer transfer to the queuing area, as this caused a lot of chaotic post-match deaths. (They’re pretty simple-minded right now.) For NPCs in general, Colin is adding randomized equipment variations and genders. This will make groups of similar NPCs far more interesting. WIP – Tech – Performance Improvements: Marc has been investigating server spikes that showed up during recent Deathmatch testing. He’s building a reporting mechanism to track down bad events and help keep the server buttery-smooth for our players. WIP – Tech – Particle Fixes: Dave has continued his quest to knock out low-hanging particle issues that could potentially cause confusion during combat. He identified the main issue that was causing particle positions to go wonky, like trailing behind players as they moved. We also confirmed that 3-4 known bugs were also closed by Dave’s fix. Tech – Ability System Improvements: Brad has been working this week to plumb event data through the client. It’s a small change, but this gives us the ability to play a different sound if a skill is interrupted, giving dB more freedom with SFX and providing more player feedback, so they can pay less attention to the UI and more to the game. WIP – Tech – Permission Updates: Christina is currently upgrading and combining the permission systems used by items and building plots. This will provide more control options to players for granting/restricting permissions on things they own, allow us to hook permissions to other types of entities (such as resource nodes), as well as create more types of permissions, such as having something be owned by a guild or a scenario team during an active scenario. 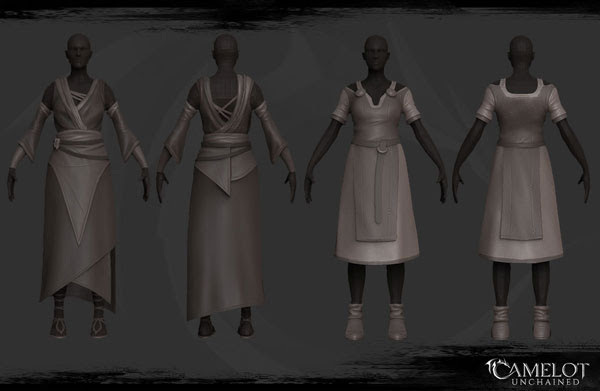 WIP – Art – Female NPC clothing: This week, Jon completed the high and low poly modeling pass of all three female clothing variations for our NPCs. Next up will be materials. Art – Animation: Scott and Brad have spent time investigating body region overrides in our animations. Per last week, characters now prioritize ability animations over flinches, and we’ve done some preliminary work into using this tech to override jump animations. Additionally, Scott has cleaned up some issues with armor geometry and worked with Brad to make sure he has what he needs to look at pairing character animations with the scorpion siege engines. WIP – Art – Ability VFX: During our playtests, we’re focusing on the most noticeable issues first. Mike and Ben have been rejiggering the VFX tags to make the system less error-prone from the start, allowing room to make it more complex later. This approach lets Mike more quickly verify that abilities are calling the correct VFX. The focus this week has been making sure healer abilities and melee impacts play a VFX. After all the abilities have something, we’ll start making more variation, as we’ve done with the new siege abilities. WIP – Art – Updated Emote Animations: Sandra completed an update on the “yes,” “no,” and “point” emotes, which most needed some love. 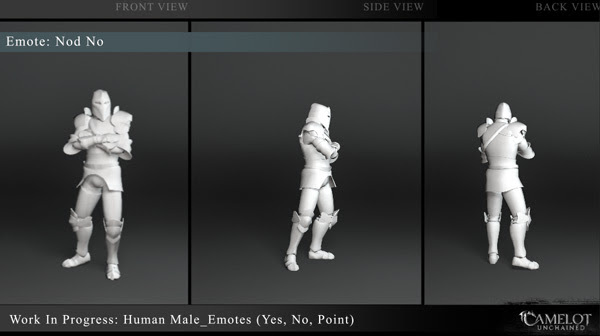 Additionally, these have been set to use a shared emote starting frame for future animation tech testing. For art this week, we start off with some of the updated emotes from Sandra. These three hit the obvious offenders, of really old work, that also hadn’t taken into account the changes in our approach with the new animation system. Additionally, our animators have simply gotten better, so a chance to improve old work was exciting. These specific three, also start from a shared pose, as a test bed for some future animation tech that will save us some time. Next up, Jon completed the modeling pass on the next two female NPC outfits, Tuatha and Viking. These follow last week’s which you can see HERE. Michelle came to us yesterday and asked if she could do a little “Happy Thanksgiving” image for the update to fill in for a short week. With her level of talent, how could we say no!? If you’re confused about the times, you can go HERE. Once again, we’ll send another email out Friday as a reminder. Have a great rest of your week, and weekend.